Border Steelwork engage Health and Safety Consultants Croner Consulting to prepare and implement a Safety Management Control System specifically tailored to our needs covering both off and on site activities. Croner Consulting also undertakes regular risk assessments and safety audits and we have access to their 24 hour Health and Safety advice line. 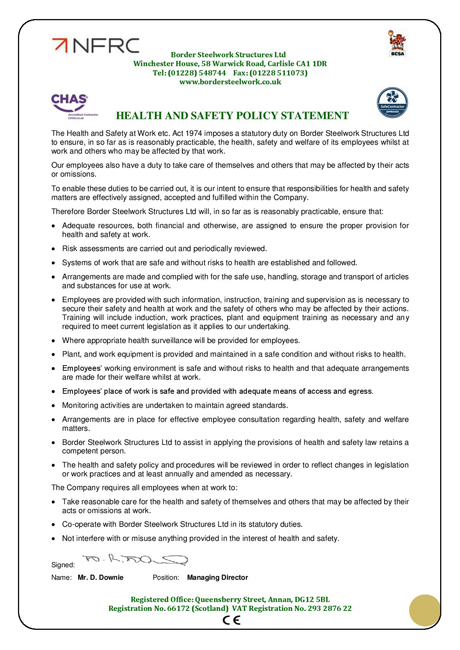 Site-Specific Safety Method Statements and Risk assessments are prepared in-house for each Contract prior to commencement on site and thereafter for any specialised activities which arise. We hold SSSTS and SMSTS training certification for onsite supervision and management. We have two in-house appointed persons for Craneage plans and assessments. We also have our own CSCS trained slingers/signallers to supervise all lifting operations. All our site operatives have undergone CITB Safety Awareness Training and hold CPCS certificates of training and achievement in the operation of mobile overhead work platforms, scissor lifts, mast climbers and telescopic handlers. They have also received PASMA, Safety Awareness, Working at Heights, Harness, Manual Handling and Abrasive Wheels training. We take our environmental responsibilities seriously, and endeavour to minimise our impact by effectively identifying, monitoring and managing any activities which may have an impact. We are committed to preventing pollution and protecting the environment, and as such comply with all relevant legislation. We are committed to reducing our use of energy and waste production. We strive to continually improve our performance by setting progressive objectives and targets, and our Environmental Policy is reviewed annually to achieve this.